The right prop will get the best performance out of your boat. Matching the propeller to your application, whether cruising, water skiing or performance, maximizes the power from your engine. It also helps with handling and acceleration. Use this guide to learn how different propeller designs affect efficiency, power, and speed and then learn how to choose the correct prop for your boat and application. The propeller has a hub surrounded by blades of the same length and size. The blades are twisted so that they push water toward the rear as they turn. This pushing is what propels the boat forward in the water. Most blades rotate in a right hand (clockwise) direction when viewed from the rear. Left hand propellers are paired with a right hand propeller in dual-engine installations to keep the boat stable and reduce steering effort. All props will be described by two numbers, such as 13 x 21. Those numbers are the diameter and pitch. Diameter is the overall size of the blade as measured from the tips. A large diameter propeller can push more water than a small diameter propeller, creating more power. Diameter is predetermined by the manufacturer for a family of products. Your prop selection will be focused on the pitch. Pitch is the distance the propeller will move the boat after one revolution (not accounting for slip). A lower pitched propeller will create more power due to more engine RPMs, but the boat will move slower. 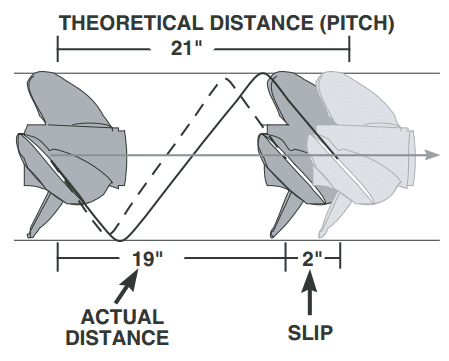 A higher pitched prop allows the boat to move faster by travelling a farther distance with each rotation. 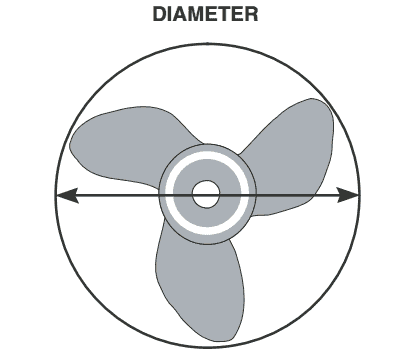 When choosing a propeller, choose a pitch that will keep the engine RPM in its recommended operating range. Going under the range will cause the boat to lug, while going over can cause engine strain. Blades have other important features built into their design. 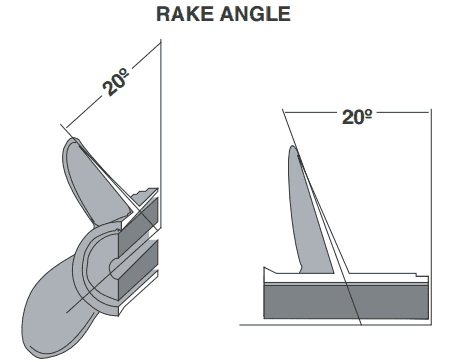 Rake is the angle between the blade and the hub. The rake angle can be flat, staying the same along the entire blade, or progressive, meaning the angle increases as it approaches the tip. Props have between 0 and 20 degrees rake. The rake angle determines how much the bow lifts out of the water. High rake propellers are ideal for light-weight, high speed boats. Too much rake, however, will strain the engine and reduce overall performance. Some propellers are cupped, which means they have a lip on the edge of the blades. The cup creates more space between the sides of the blades, reducing ventilation and slippage. If the cup is on the tip of the blade, the blade has an increased rake angle and a higher bow lift. If the cup is on the trailing edge, it effectively increases the pitch size, and the propeller will create more power at the cost of engine speed. Blades are also designed to prevent ventilation and cavitation. Ventilation is when air is drawn around the blades between the blade surface and the water. Ventilation increases RPM but reduces speed, especially during hard acceleration. The anti-ventilation plate mounted on the outboard helps to prevent this problem. 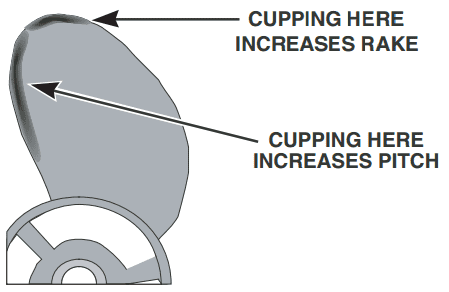 Cavitation is caused by water flow disturbances around the blades. Disturbances cause water bubbles to boil and burst against the blades, which damages the surface and reduces performance. The fewer number of blades a propeller has, the more efficient it is. However fewer blades will also increase the "vibration" you will feel. 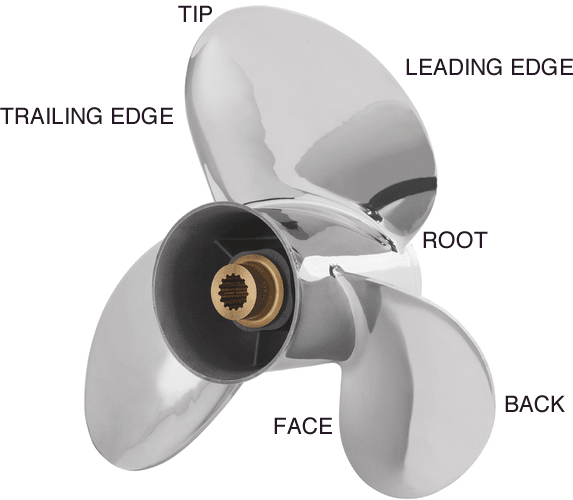 That’s why three blade propellers are the most common for general purpose boating. Three blades props provide the best combination of performance, speed, and efficiency. Some manufacturers also create four and five blade propellers to increase acceleration and reduce ventilation. A four blade propeller will improve handling and control for high-performance applications. Five blade propellers are good for rough water conditions and tow sports. Finally, material is an important consideration for your propeller. Aluminum props are a great balance of cost, performance, and durability. Stainless steel is five times stronger than aluminum, dramatically improving performance and durability. Stainless steel propellers offer better acceleration and are less likely to be damaged from striking objects in the water. Stainless steel props will outlast aluminum multiple times over. Left: a stainless steel propeller. Right: an aluminum propeller. Before you dive into choosing a propeller, understand your boat’s intended use. 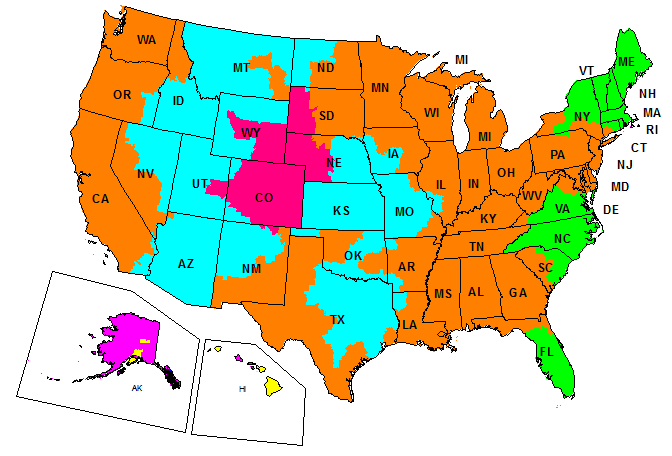 Consider your average speed, load, and boating location. If you will be using the boat for multiple applications, you may need to switch props. The propeller choice directly affects the engine RPM and therefore its performance. Choose a propeller that puts the engine RPM at the midpoint or higher of the wide open throttle (WOT) range with a normal load. This operating range will translate to the highest horsepower available from your outboard. Refer to your engine operating manual for the operating range. Once you know the operating range, consult the propeller guide for your engine to pick a combination of pitch, blade number, and material. Choose a range of propellers to perform a water test. Test the props under the same conditions that you would typically use the boat—same load, gear, and water. Set the trim angle so the boat has optimum speed on top of the water. To test the prop, run the boat at WOT and observe the maximum engine RPM on a tachometer. If the RPM is below the recommended operating range, switch to a propeller with lower pitched blades. If the RPM is higher, switch to a propeller with higher pitched blades. Each inch of pitch size will change the RPM by 150-200 RPM. Aim for the midpoint or higher of the recommended operating range. Keep in mind that high altitudes will reduce engine power, so choose a lower pitch to achieve the same RPM as on sea level. Engine height also affects the performance of the propeller. Once you find the right prop, adjust the engine mounting height to create the best balance between speed, maneuverability, and acceleration. Start with the anti-ventilation plate even with the bottom of the boat. Raise the engine one mounting hole at a time until performance is unacceptable, and then lower the engine one hole down. Keep a spare prop onboard for emergency situations. One recommendation is to buy a spare propeller that is two inches lower in pitch than your standard propeller. This reduction in pitch is perfect for tow sports, such as water skiing, due to a slower acceleration and higher power.